Feast like a pirate, dine like a captain! - The Captain's Boil - Shut up and eat. Think of the food scene in Montreal, what’s the first thing that comes to mind? Poutine? Smoked meat? Foie Gras? Those are a given. 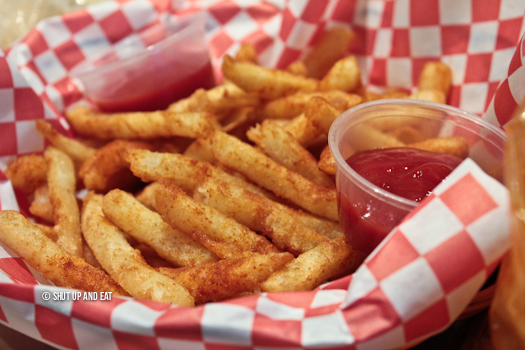 But do you ever stop to think why these foods are the first things that native Montrealers will say or even visitors will have in mind when coming to the city? It’s because of our “food culture”, it’s basically what we’re known for. For the same reason when you say Singapore or Thailand, you’re thinking delicious street food hawkers, or golden baskets of fish and chips from England. Despite not having particular inherent cuisines native to Montreal (or even Canada for that matter,) being a gastronomic destination and foodie city, some of the most interesting and unique foods are well represented. 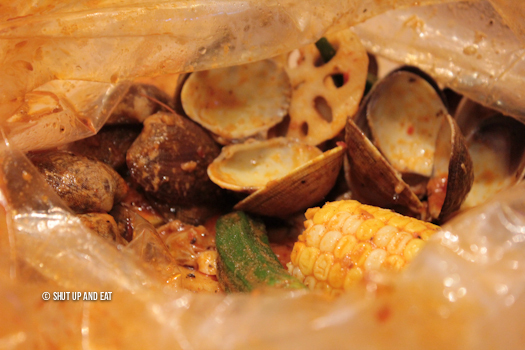 Case and point; Captain’s Boil – Asian style seafood boil. 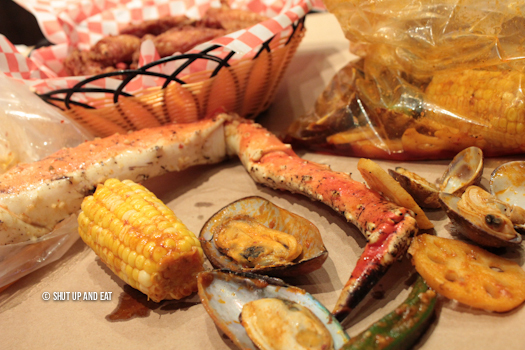 “Feast like a pirate, dine like a captain!” You may or may have not seen the two relatively new seafood themed restaurants in town aptly named The Captain’s Boil. A spot specializing in Asiatic Cajun seafood boils. What makes a Cajun seafood boil Asian? The cooks? No. The addition of different spices and aromatics into the boil such as ginger, lemongrass, lime leaves, for example, as well as different dipping sauces and seasoning. I’ve had similar elsewhere, but never in Montreal, so I was pumped when I had the opportunity to check this place out. The menu is simple, You choose your catch; lobster, Dungeness crab, king crab legs, snow crab legs, shrimp, clams, mussels, chicken slices and seasonal crawfish (NOW!!). Then pick your choice of seasoning; cajun, lemon pepper, garlic sauce and the signature “Captain’s Boil” “a perfectly balance combination of all the sauces.” To top it off, you select how spicy you want it, from non-spicy to “FIRE”. We ordered the mussels in the Captain’s Boil seasoning. They were huge, plump and juicy, and its inherent flavour was not lost in the spiciness of the sauce. The seasoning was bold and vibrant, notes of smokey paprika and zesty citrus. 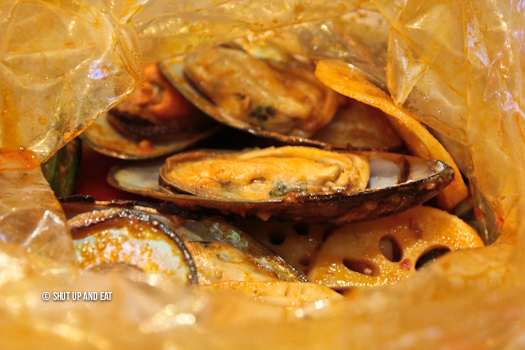 We got the clams in cajun sauce and felt the heat at a medium spice level. Like the mussels, these clams were large and the portion was generous. The natural sweetness wasn’t lost in the aromatic seasoning, amazing. Each bag of goodies is served with slices of lotus root, okra and corn on the cobb. The food is served in bags on your table. No plates, no utensils, plastic gloves and a Costco sized roll of paper towels are provided. Ok, yes they do have cutlery, but who needs the pageantry when you’re mission is to stuff seafood into your face as fast as possible? We also ordered the king crab leg. As you can imagine, the thing was huge. I made the decision to forego the seasoning and asked for it to be mixed with garlic butter. This is the move. Don’t ruin this treasure of the sea with over the top seasoning, it would be a disservice to the crab fishermen. All it needs is a little bump to bring out it’s natural flavour. The meat was plentiful and was as tender as can be. The market price is reasonable, still relatively pricey, but worth it. The gloves came off for this one… only because the spikes kept ripping holes in them. The cajun seafood fried rice is where it’s at. 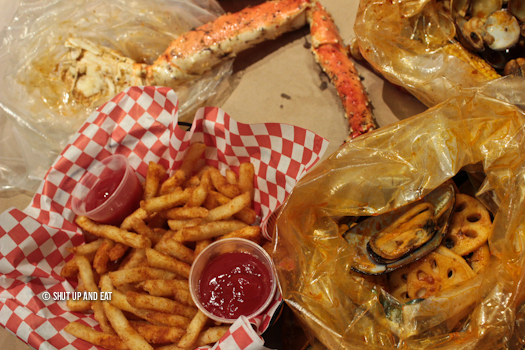 Chowing down on literal pounds of seafood is cool, but you need a base. 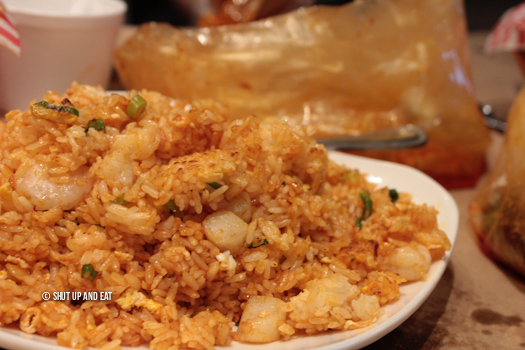 The spicy fried rice that features plump shrimps and tender bay scallops is what you’re going to order. Trust me. We also had a few bites to start while waiting for our sea bounty. We were recommended the chicken wings. 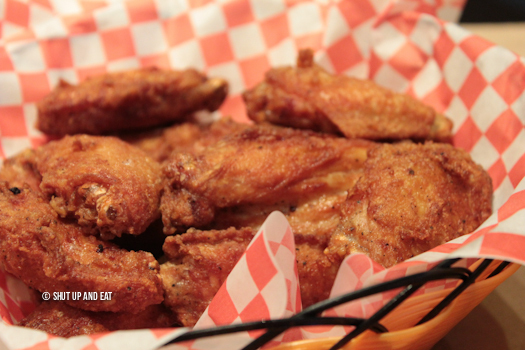 Sizeable golden crispy wings tossed in cajun seasoning. These were great bar wings, but nothing to bug out over, I was here for seafood. A southern summer favourite typical in part of Louisiana and Texas and around the Gulf of Mexico. The traditional cajun seafood boil took on a unique twist when Vietnamese and southeast Asian fishermen (who immigrated to the region in the 60s and 70s) added their own familiar flavours to the mix and prepared it in a way that was familiar with their palates. Despite the region, despite the culture, that’s how all amazing food starts. Immigrants settling into a new land, taking what they have on hand and turning it into something that reminds them of home. Example 1) Montreal bagels, example 2) Montreal smoked meat. The Captain’s Boil has two locations in Montreal, one in Chinatown and one downtown. Be prepared to get down and dirty and eat with your hands. Bibs are provided.